Why is it that more than half of the modern "interpretations of quantum mechanics deny the "collapse of the wave function." Why are so many serious physicists and philosophers of science so unhappy with this concept, which was a fundamental part of the "orthodox" theory proposed in the late 1920's by the "founders" of quantum mechanics - Werner Heisenberg, Niels Bohr, Max Born, Paul Dirac, Wolfgang Pauli, and Pascual Jordan. We can give the simplest answer in a single word - chance. Albert Einstein, the foremost scientist of all time (and ironically the discoverer of chance in quantum mechanics, which he disliked but never denied was a part of the quantum theory, as far as it could go in his time) adamantly disliked the idea of "uncertainty" or "indeterminism," the thought that some things in the universe were not caused (or only statistically caused). The idea of the wave function in quantum mechanics and its indeterministic collapse during a measurement is without doubt the most controversial problem in physics today. Of the several “interpretations” of quantum mechanics, more than half deny the collapse of the wave function. Some of these deny quantum jumps and even the existence of particles! So it is very important to understand the importance of what Dirac called the projection postulate in quantum mechanics. The “collapse of the wave function” is also known as the “reduction of the wave packet.” This describes the change from a system that can be seen as having many possible quantum states (Dirac’s principle of superposition) to its randomly being found in only one of those possible states. Although the collapse is historically thought to be caused by a measurement, and thus dependent on the role of the observer in preparing the experiment, collapses can occur whenever quantum systems interact (e.g., collisions between particles) or even spontaneously (radioactive decay). The claim that an observer is needed to collapse the wave function has injected a severely anthropomorphic element into quantum theory, suggesting that nothing happens in the universe except when physicists are making measurements. An extreme example is Hugh Everett’s Many Worlds theory, which says that the universe splits into two nearly identical universes whenever a measurement is made. Perhaps the best illustration of the wave function is to show it passing though the famous slits in a two-slit experiment. It has been known for centuries that water waves passsing through a small opening creates circular waves radiating outward from that opening. If there are two openings, the waves from each opening interfere with those from the other, producing waves twice as tall at the crests (or deep in the troughs) and cancelling perfectly where a crest from one meets a trough from the other. When we send light waves through tiny slits, we see the same phenomenon. Most of the light that reaches light detectors at the back lands right behind the barrier between the slits. At some places, no light appears in the interference pattern. Today we know that light actually consists of large numbers of individual photons, quanta of light. Our experiment can turn down the amount of light so low that we know there is only a single photon, a single particle of light in the experiment at any time. What we see is the very slow accumulation of photons at the detectors, but with exactly the same interference pattern. And this leads to what Richard Feynman called not just "a mystery,” but actually "the only mystery” in quantum mechanics. How can a single particle of light interfere with itself, without going through both slits? We can see what would happen if it went through only one slit by closing one or the other slit. 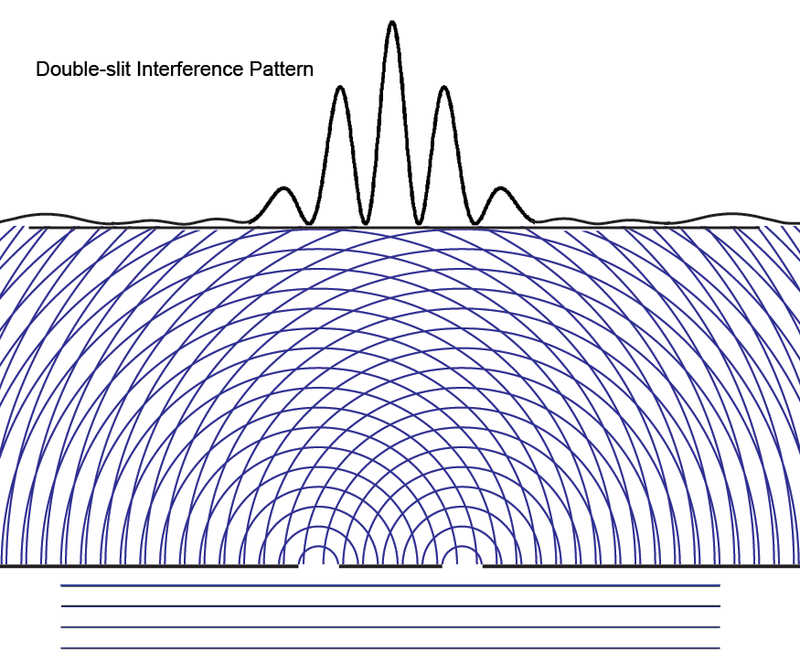 We get a completely different interference pattern. Feynman was right. If you can comprehend, though perhaps not “understand,” this highly non-inuitive phenomenon, one that is impossible in classical physics, you are well on your way to appreciating quantum mechanics. Max Born interpreted the wave function ψ(x) at a position x as telling us that the complex square of the wave function, < ψ(x) | ψ(x) >, gives us the probability of finding a particle at that position. So the quantum wave going through the slits (and this probability amplitude wave ψ(x) does go through both slits) is an abstract number, neither material nor energy, just a probability. It is information about where particles of light (or particles of matter if we shoot electrons at the slits) will be found when we record them. If we imagine a single particle being sent from a great distance away toward the two slits, the wave function that describes its “time evolution” or motion through space looks like a plane wave - the straight lines of the wave cresta approaching the slits from below in the figure to the left. We have no information about the exact position of the particle. It could be anywhere. Einstein said that quantum mechanics is “incomplete” because the particle has no definite position before a measurement. He was right. When the particle lands on one of the detectors at the screen in back, we can represent it by the dot in the figure below. The interfering probability amplitude waves disappear instantly everywhere once the particle is detected, but we have left a small fragment of interfering waves in the upper left corner to ask a question first raised by Einstein in 1905. What happens to the small but finite probability that the particle might have been found at the left side of the screen? How has that probability instantaneously (at faster than light speed) been collected into the unit probability at the dot? To be clear, when Einstein first asked this question, he thought of the light wave as energy spread out eveywhere in the wave. So it was energy that he thought might be traveling faster than light, violating his brand new principle of relativity (published two months after his light quantum paper). Einstein came to call this spukhafte Fernwerkung, “spooky action at a distance.” It is known as nonlocality. Niels Bohr recalled Einstein’s description. He drew Einstein's figure on a blackboard, but he did not understand what Einstein was saying. Einstein referred at one of the sessions to the simple example, illustrated by Fig. 1, of a particle (electron or photon) penetrating through a hole or a narrow slit in a diaphragm placed at some distance before a photographic plate. On account of the diffraction of the wave connected with the motion of the particle and indicated in the figure by the thin lines, it is under such conditions not possible to predict with certainty at what point the electron will arrive at the photographic plate, but only to calculate the probability that, in an experiment, the electron will be found within any given region of the plate. The apparent difficulty, in this description, which Einstein felt so acutely, is the fact that, if in the experiment the electron is recorded at one point A of the plate, then it is out of the question of ever observing an effect of this electron at another point (B), although the laws of ordinary wave propagation offer no room for a correlation between two such events. Although we cannot say anything about the particle’s whereabouts, we can say clearly that what goes through the two slits and interferes with itself is information. The wave function tells us the abstract probability of finding the particle somewhere. The idea of probability - or possibilities - “collapsing” is much easier to understand. When a die is rolled and the number 6 shows up, the possibilites of 1 through 5 disappear instantly. When the wave function collapses to unity in one place and zero elsewhere, nothing physical is moving from one place to the other. Consider a horse race. When the nose of one horse crosses the finish line, his probability of winning goes to certainty, and the finite probabilities of the other horses, including the one in the rear, instantaneously drop to zero. This happens faster than the speed of light, since the last horse is in a “space-like” separation from the first. Although horse races are not (normally) influenced by quantum mechanics, the idea of probability collapsing applies to both. The only difference is that in quantum mechanics, we are dealing with a complex probability amplitude that can interfere with itself. Note that probability, like information, is neither matter nor energy. When a wave function “collapses” or “goes through both slits” in the dazzling two-slit experiment, nothing material is traveling faster than the speed of light or going through the slits. No messages or signals can be sent using this collapse of probability. Only the information has changed. This is similar to the Einstein-Podolsky-Rosen experiments, where measurement of one particle transmits nothing physical (matter or energy) to the other “entangled” particle. Instead instantaneous information has come into the universe at the new particle positions. That information, together with conservation of angular momentum, makes the state of the coherently entangled second particle certain, however far away it might be after the measurement. The standard “orthodox” interpretation of quantum mechanics includes the projection postulate. This is the idea that once one of the possibilities becomes actual at one position, the probabilities for actualization at all other positions becomes instantly zero. New information has appeared. The principle of superposition tells us that before a measurement, a system may be in any one of many possible states. In the two-slit experiment, this includes all the possible positions where |ψ(x)|2 is not zero. Once the quantum system (the photon or electron) interacts with a specific detector at the screen, all other possibilities vanish. It is perhaps unfortunate that the word “collapse” was chosen, since it suggests some great physical motion. Just as in philosophy, where the language used can be the source of confusion, we find that thinking about the information involved clarifies the problem.